The conference is held at the Younes Conference Center at 416 Talmadge Road in Kearney, Neb., which is located directly behind the Holiday Inn at the first intersection north of I-80. BOOK EARLY. 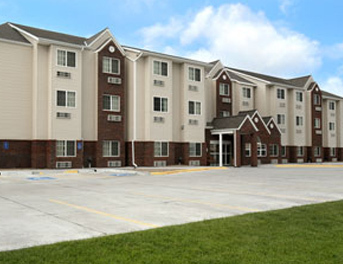 Kearney is the hub of much convention and event activity and often many hotels are full. We have rooms blocked off in the hotels listed below, however they will be released mid-March, meaning you may not be able to receive the conference rate or a room after that date. To get the conference rate at these hotels, please mention you are with the Brain Injury Conference when making your reservation. There are many hotels along 2nd Avenue within a few blocks of the conference center that are lower priced. Please click on the hotel names,or for more, the picture below. Is on the NW corner of 2nd Avenue and Talmadge about one block from the Younes Conference Center. Is on the NE corner of 2nd Avenue and Talmadge about one block from the Younes Conference Center.